Kobe Fashion Museum: Kimono Exhibit | Ready, Set, Kimono! Literally a few hours ago, I got back from Kobe and seeing the special exhibit at the Kobe Fashion Museum, “Kimono From The Kofun To The Edo Period.” I’m lucky that Kobe is only a couple of hours from where I live. If you are able to go before the exhibit ends on January 12, 2016 I highly recommend it. The official website and information can be found here. So how was the exhibit you may be asking. Well, unfortunately, I couldn’t take any photos while I was in the galleries, so this post will be very text heavy I’m afraid. But here were some of the things that struck me the most. The exhibit was large. Three whole galleries to explore. I came around one corner and expected it to be over when to my delight, there was another great hall full of kimono for me to drool over. The galleries were set up so that I made two or three trips through the hall to see everything. Unfortunately, there was very little English. The woman at the front counter gave me an English pamphlet with some info about the different eras, but it wasn’t that helpful I’m afraid. I only wish I knew more kanji. The placards beside each piece were full of info, but there were so many technical, specialized, and advanced kanji that I couldn’t read them. I seem to remember reading somewhere before I went that these pieces would be reproductions. If they were, I couldn’t tell. most of them had small stains, rips, and repairs in them. By the end of the exhibit, I was convinced that they were real pieces from the time periods. If they weren’t, then my hat goes off to the curators who managed to age the pieces so convincingly. One thing that particularly struck me was the apparent difference in width between the sleeve and the back panels of older kimono, especially since I’m used to looking at modern kimono. First, the sleeves were much more rounded back then, and they were smaller. I don’t know if it was just the small sleeves that made the back panels look wider, but it looked that a bolt of kimono cloth used to be wider in the past than it is now. And they were small! I’m always struck by how much shorter people were in the past. Even if the kimono were wider, there is no way they would fit my 165 cm monstrous frame! The museum’s permanent exhibit was also really interesting. It included different types of dress from France, England, and America from the time of Napoleon until modern day. These were all reproductions and they clearly stated it on the placards, so it makes me believe all the more that the kimono were genuine pieces. Overall it was a great experience and I hope you can get out to see it of you are in the area! 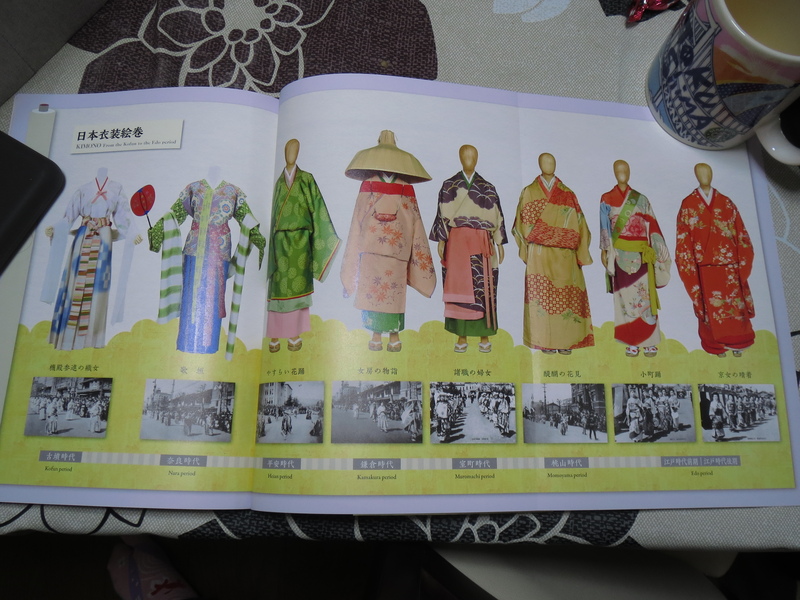 A page from the souvenir book showing the progression of the kimono through the different eras. An example page from the souvenir book. This is a good example of what I was describing with the small sleeves and seemingly wider back panels. 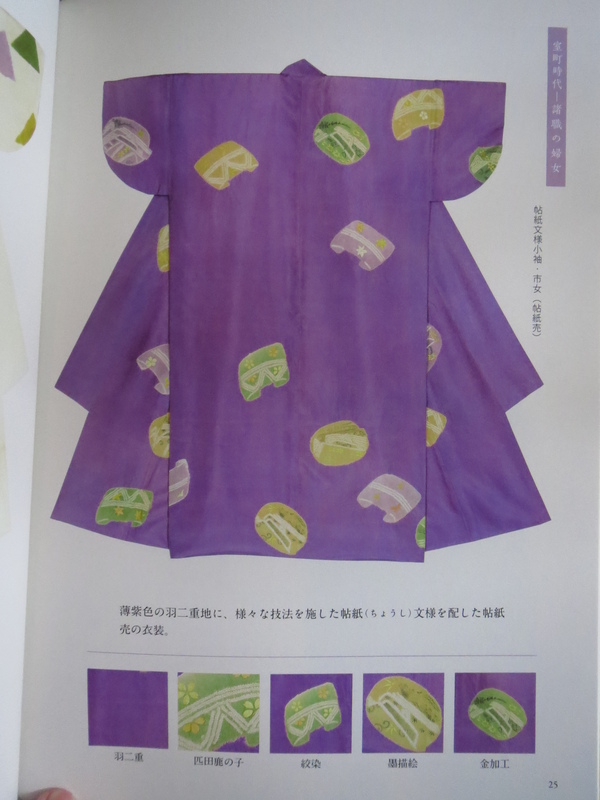 You can also a list of the different techniques used to create this kimono at the bottom. Just a point about the age of the kimono in that exhibition. I read somewhere, recently, that those of the earlier periods are reproductions made in the early 20th century. So if they had been stored, moved around and so on, they might look a bit worn by now. Wish I could have gone! That would explain why they looked old even though they are reproductions.